" TO HELL... WITH WAR "
I am linking your essay to my blog. Yes, Al Gore will run, as well he should run. Mr. Gore will just sit back and let all comers enter the race, make fools of themselves, drop out, etc., then sometime around the beginning of 2008 -- possibly the spring, Mr. Gore will declare his candidacy and blow everyone else out of the water. We could very well be talking about a Gore/Obama ticket for 2008. And a beautiful thing that will be! Happy New Year, Andy. Good to see you back. Your argument is based on a belief that FuriousGeorge and his cabal won't declare martial law in 2007/08 and cancel elections. These socio/psychopaths will have to turn one mighty big leaf before they give up unbridled power. And secondly, the new congresscritters haven't even been sworn into office and already we're being slathered with wall-to-wall about the 2008 elections. This is ridiculous and sickening. Andy, you know I love your blog and your mission, but I got to keep telling you, Obama is not just hype. He's a rock solid leader with the substance and style that comes along once or twice a century. Why do you think Warren Buffet and Ethel Kennedy caught on to him long ago. I live in Chicago, am cynical about most politicians (Dem or Rep), but think this guy is different. As for Gore? How about head of the EPA and responsible for the US leading the charge on dealing with Global Warming? This is Gore's passion. Moreover, centuries for now, this could be the turning point that would leave him with a far richer legacy than any recent President. Global Warming will be remembered and studies long after Iraq is a distant memory. I agree about Obama lacking seasoning and issues of Hillary's electability. Edwards charm over Gore's gravitas for the win, in our current culture. To my view, every Dem should drop out and Gore should be ushered in as the nominee, as he had the 2000 Election ripped off by a Supreme Court decision corrupt on its face. John, get real. if Obama wasnt black no one would be talking about him. Besides being a charsimatic, articulate pol in a white man's Senate, tell me something he's actually done in his big two years in national politics? Go ahead. We agree on the charisma, the charm, the hoopla as Ostroy calls it. But please do enlighten us John as to what the man has actually accomplished as a politician. Talk to us about his experience, about his qualifications to hold the most important, most powerful job in the world. Because that's how we elect presidents. If I wanted charm, charisma, articulation I'd vote for George Clooney or John Stewart. Andy's right, and he's saying what most won't. That Obama is getting an awful lot of attention and points simply for being Black. ok, we'll be waiting here for your substantive reply. Thanks for correcting your blog. But now you also forgot to list Dennis Kucinich as a declared Democratic candidate. Please recorrect your blog. We have to agree with Andy on Obama. Just because he is a ball of fire in Chicago, doesn't mean he translates at all to other parts of the country. In the reddest state, we doubt even the few democrats living here would be behind Obama. His time has not come, yet. Gore has huge advantages over any other candidate in the areas of experience and perception. The perception being that somehow he was cheated out of the presidency by underhanded Republicans is very powerful stuff. If he was cheated, then the democrats were cheated, and the country was cheated. Americans love to see the underdog vindicated. The best case scenario would be to legally prove that Gore had been cheated. It would set sentiment for the GOP back for eons. The dems would be wise to follow Dean's 50 state plan and pick a more universal candidate, such as Gore, to head the ticket. He's got exposure, experience, sympathy, and intelligence on his side. PS: Andy, we are glad you're back and fighting the good fight! I pray you are right. I have prayed every night for the past 6 years that Al Gore would run for President again. He is the only one! As for Obama, i also believe that the hoopla will end. He's got charisma, but then, so they say did "W". The last thing this country needs is another charismatic President who doesn't have any experience. We are facing a total disaster in this next decade. We are still in Iraq, we have a 9 trillion dollar deficit, the country is heading into a recession/depression, the rest of the world is horrified with us & the baby boomers are going to start retiring in large numbers - well the ones who can afford it. Top this off with a complete lack of a social safety net & you can start to appreciate just how badly we are going to need somene in the WH who actually knows what they are doing. We need someone with foresight & quite frankly, every single thing Al Gore predicted has come true. Besides, there isn't any better pulpit to advance global warming from that the one at 1600 Pennsylvaian Avenue. Al's smart, he knows this. I just hope he is willing to serve again. kucinich? Are you kidding? i like ostroy's Jon Stewart idea better. kucinich is a total non-factor and if he's lucky will get 1% of the vote. ostroy should no more incoude kucinich than he should the Rev. Al. Not just hype like some. Tons of experience as govenor in a raddish/blue state where that office has more power/responsibility than say Texas. No baggage slung at him (yet) by right wing spinners. I'd love to see Gore run. He is certainly the grown up in the room. Still, I like Edwards and feel he could win if Gore didn't run. I think he is much more than just a nice guy. Buy the way, love what Anon 2:35 said about Obama and Chicago/Illinois. So true. Still waiting for someone, ANYONE, to provide a substantive case for Obama besides his charisma and speaking skils. Haven't we as a nation realzied yet that we should be electing to the office of president only the most qualified individuals our nation has to offer? As we've learned from Baby Bush, this ain't a job for on-the-job-training. I'm a lawyer, and I know tons of very intelligent, charismatic, articulate lawyers and business people. None of them are truly equipped to be president, and all of them are as "dynamic" as Obama. Please, enough about Obama already. I think Edwards has possibilities, too. He is passionate about quality of life issues that desperately need to be addressed after years of neglect and abuse by BushCo. What remains to be seen is what kind of fight he can put up. Obama and Hillary would face so much ingrained fear/hatred on the basis of race and gender, in addition to the dislike Hillary has garnered on a personal level and Obama's lack of experience, that it's almost impossible to imagine either of them could get enough votes to win against a strong Repub candidate. And McCain is likely to be a strong candidate--we can't stand him, but we wouldn't vote for any Repub. Gore in 2008. Or sooner. Kevin Phillips maintains that if Bush and Cheney resigned or were impeached, Dems could choose anyone, even someone not a member of the current Congress, to fill out the term. If that were to happen, let's hope they would have the sense to ask Gore to pack his toothbrush and move in within the hour. There's no doubt in either my mind, or in a huge majority of reality-based Dems's minds, that the Goracle is truly the only really viable candidate out there. The person who gets this job must be incredibly experienced, intellectually acute/flexible/curious, and have impeccable political credentials. That is Al. I've said it a million times. He's the Man. Happy New Year, everyone! Let's hope that sanity reigns in 2007. This country needs it! Does Al Gore have more experience than Obama? Absolutely. Does he have the ability to be elected President? That's what I'm worried about. Like it or not, it does take charisma and likability to be elected President. I'm afraid Gore, once he hits the campaign trail, is going to start turning off voters again, despite his good ideas and experience. If Gore shows he can lead Americans rather than preach to them, I can be pursuaded to support the man. Likewise, if Obama fails to develop a platform of workable ideas in the next year, he's not the right man. But to toss him out of the equation because of your prequisite, which is MADE UP (less experienced candidates have been elected), is doing everyone a disservice. Listen to what the man has to say, then decide. Glad to see your return, Andy. If charisma and likeability are so important to the voters, then explain Bush. Unless a crooked smirk and a vacant stare were misconstrued as charisma, I think the voters may also take current issues with them to the polls. Many deluded people thought Bush would be stronger in the face of terrorism (by being a terrorist?). Gore's passion for the environment seems logically congruent with the position of President and not just heading the EPA. I have this pertinacious li'l feeling that some of our government's current interest in the Middle East may have to do with black gold. Wouldn't it be nice to know that a potential leader could free us of that dependence, other resulting future wars and global warming with his knowledge and passion for exploring alternate forms of energy? I think that would be swell! Props on the Adrienne Shelly Foundation. I have blogged it and once I am able, I will give monetarily. I read all the posts above and was glad for the raves for Gore and believe all the good comments to be true. However, I was especially glad to read "John from Chcigao" who pointed out the reality of the American people's demand for charisma and likability and Gore's tendency to preach rather than charm. Not only that, he looked as though he could not face a fight when he wasn't more aggressive over the determination of the Flordia vote. I'm for Gore, but he needs serious handling by a campaign coach who can help him display the charm he showed on The Daily Show. As for Hillary and Obama -- we need to face the racism and sexism in this country and realize neither has a chance at this time. lets be clear abaout one thing: charisma and passion are important qualities in a presidential candidate, but not the only important qualities. Just look at Bush, the guy the idiot repugs "wanted to have a beer with." Great, and what we got was an experienced fool who turned the country, and half the world, upside down. Lets give the American voter a little more credit this time around. The November victory for Democrats is clear proof that voters want change. They want politicans who have the experience to lead us out of the military and economic mess we're in. Obama is nothing more than a charming Black man with passion. If he were white he'd be, well, John Edwards! Case closed. Now, I'm still waiting for someone, ANYONE, to show me Obama's political experience that merits him having the most imporant, most powerful job in the world. I also agree Gore would be the best choice for President in 08. Who else does the dems have? Hillary will win no southern states, Edwards is cute but not ready, same for Obama (better as a VP). Get your T-shirt here Re-Elect Gore. Welcome back Andy, and with some great posts no less! 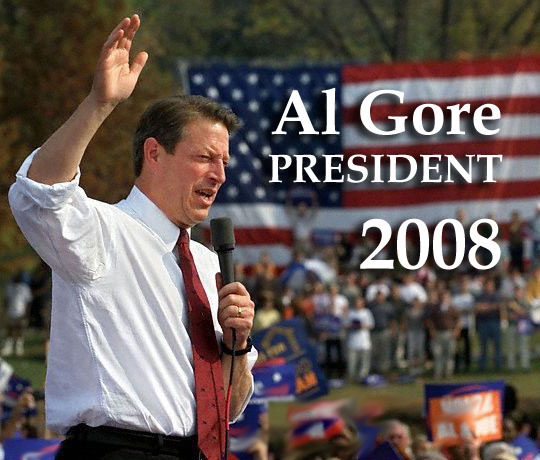 Gore absolutely has to run in 2008. The "Draft Gore in 2008" movement is alive and chugging, and as noted recently, he has left the impression that he is giving it plenty of thoughtful consideration. Here's wishing the best to the 100th Congress for its own sake and for tilling the soil for 2008! You know what let's bring them all in and vote. I betcha Gore wins. That is how leaders in this country are chosen. Anyone who argues against getting Gore in the primary doesn't deserve to be there. As far as electability and charisma-that is how the nominee is decided. If you want some other way to choose our leader say a beauty contest or decathelon it is time to think about a change of address. Of course he belongs on the ballot. I too wish Gore would run. We thought that in 2004, but he didn't run then. I'm betting he won't run in 2008. Does anyone know something I don't, as to the fact that he WILL run? my vote is for Gore!!! Gore/Obama or Gore/Edwards sounds like a winner to me!!! Al Gore is the only eligible candidate that I feel like I can trust. In the 2000 election debates, he was the only Presidential candidate to really answer the questions rather than change the questions to what he wanted to talk about. Al Gore is a gentleman and I feel like he would willingly give his honest opinion on any subject. I do not feel that he would deceive the public in any way, like many politians do today. And we definitely need a President we can trust after experiencing one who would not listen to the people who voted him in. Al Gore is a man of vision. Not only does he see problems as they are today, but he sees possible consequences in incorrect decisions. We need such a man a President.